For Ariane Jimison, both pottery clay and pizza dough are suitable for creative expression. 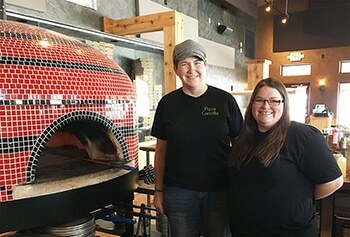 Ariane and her partner, Rachel Kalenberg, own Pizza Carrello, a 147-seat restaurant located at 601 South Douglas Highway in Gillette. Their pizzas are baked in a wood-fired oven affectionately named “Sophia,” the design of which dates to ancient Rome. The business also serves delectable bread, stuffed pita sandwiches, and salads. Sophia is an igloo-shaped, masonry oven decorated with red and black mosaic tile. It uses no gas or electricity and has no controls. Since oven temperatures range between 600◦F and 1200◦F, pizzas cook very quickly, and extra vigilance is required to ensure the food is not cremated. “We have hyper-focus when it comes to utilizing the fire,” Ariane said. In addition to Sophia, Pizza Carrello also has two smaller ovens on trailers that are used for events off the premises. Ariane and Rachel hadn’t set out be restaurant owners. The idea for Pizza Carrello originated not at a food conference or entrepreneur workshop, but at a music festival. Several years ago, a downturn in the Gillette economy eroded Ariane’s modest pottery income dramatically. Then a trip to the Beartrap Music Festival near Casper changed everything. Ariane watched as a man with a mobile hotdog stand raked in money and had loads of fun doing it. In addition to making pottery, Ariane has been an avid bread baker and a food lover dating back to her childhood days on a family farm in eastern Montana. Inspired by the hotdog seller, and coupled with her love of food, Ariane decided to build a wood-fired pizza oven mounted on a trailer that she could take to art festivals. 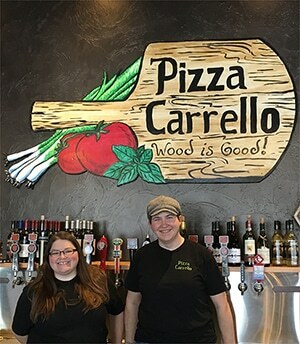 Ariane and Rachel started Pizza Carrello — which means “Pizza Cart” in Italian – in 2011. 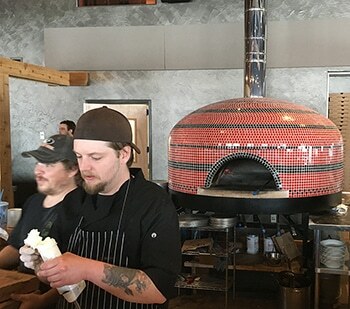 They set up a trailer-mounted, wood-fired pizza oven just about anywhere there were hungry people to feed, from festivals and funerals, to rodeos and parking lots around Gillette, sometimes working two or three events a day. At one of their first big events, the Donkey Creek Music Festival in Gillette, the food line didn’t stop for three days. Ariane and Rachel also found a cooking spot behind the Gillette Brewing Co., which served beer but no food. They prepared pizzas in a small room then rushed outside to cooked them in a wood-fired trailer oven. Eventually, they moved the oven to the front of the building and shoved pizzas to customers out a window. In October 2015, they started a little shop of their own. “We were there for about a month when we realized it was probably way, way too small,” Ariane said. So in November 2016, they upgraded Pizza Carrello again. 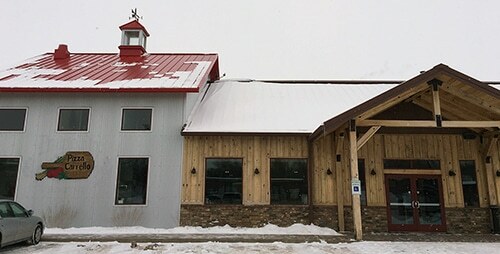 With the help of a U.S. Small Business Administration loan, they leased space in the vacant Prairie Fire Brewery building, remodeled the interior, added new furniture, and obtained a bar and grill liquor license. The public loved it. So crazy, in fact, that Ariane and Rachel are considering whether to expand again and are weighing other options including franchising. Olin Oedekoven often calls Pizza Carrello to provide food for his business meetings. He is president and CEO of Peregrine Leadership Institute and Peregrine Academic Services. He is also a regular restaurant customer. 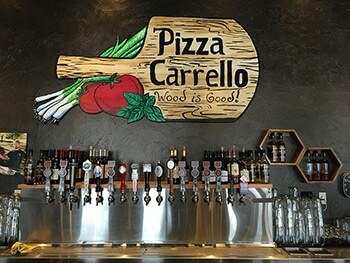 The Pizza Carrello business model is unusual, if not unique. The primary focus is not on the bottom-line, but on the restaurant’s employees and the community. By design, owners Ariane and Rachel are also the lowest paid members of the Pizza Carrello staff, including the dishwashers. “We’re a social enterprise, so we take the money we would normally take as a paycheck and reinvest that back into the company,” Ariane said, which means the business can attract dedicated workers. Plus it’s just the right thing to do. Ariane and Rachel also want their 27 employees to be able to build wealth and support their families with a livable wage. “We want long-term, 20-year-long or longer relationships with these people. My entire purpose is seeing that happen in an industry where people are stepped on a lot,” Ariane said. 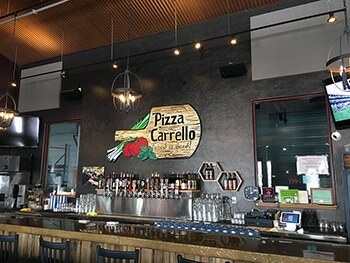 She hopes Pizza Carrello might even become a change leader for the entire food service industry where employee treatment is concerned. In sum, she said the business has been built more on sacrifice than capital. And it’s been immensely fun and satisfying to see it all come together and to see how a business can be such a positive force in the lives of working people. The Pizza Carrello staff also takes pride in their contributions to community organizations. “We’ve probably given something like $30,000 in free pizza alone,” Ariane noted.  From the start, the Wyoming Small Business Development Center Network and Regional Director Susan Jerke have been valuable partners for Ariane and Rachel. Susan still drops by now and then, orders a pizza and asks how things are going, or relays information about conferences or events coming to town that might need food service. More importantly, Ariane credits Susan with giving them the confidence to pursue their business vision despite an abundance of naysayers. “I can’t really express how big that was when you’re trying to reach out and do something that might seem totally crazy, that does go against a lot of common practice and thought and theory,” Ariane said.